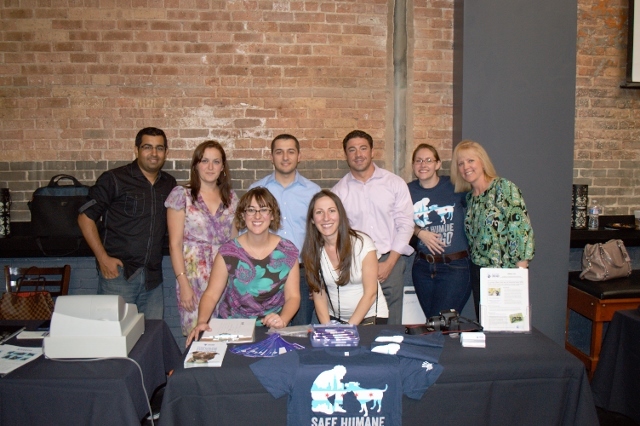 Our project scope was to raise substantial funds as well as awareness for our desired charity, Safe Humane, through a fundraiser event held at a Bar/Restaurant that is willing to assist in our fundraising efforts. 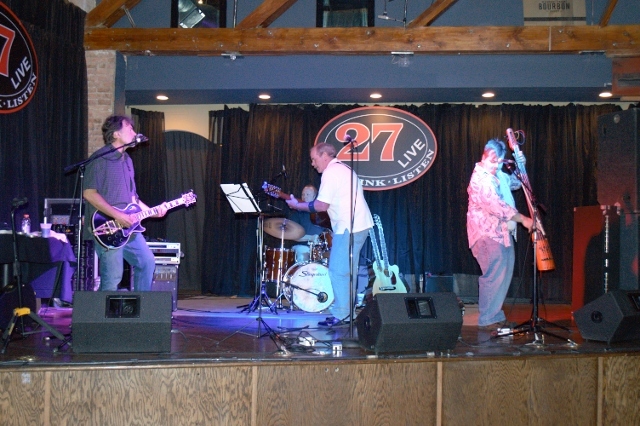 The location we selected was 27 Live in Evanston. 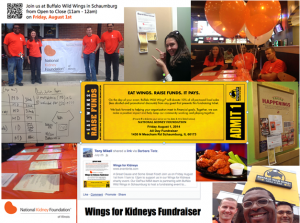 Our main goal was to raise money through tickets sales, food and liquor sales at the event, on-site auctions and charitable donations donated at the event or online through Eventbrite. 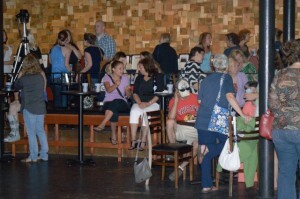 Our event took place at 27 Live Restaurant & Bar on Thursday, July 31st. 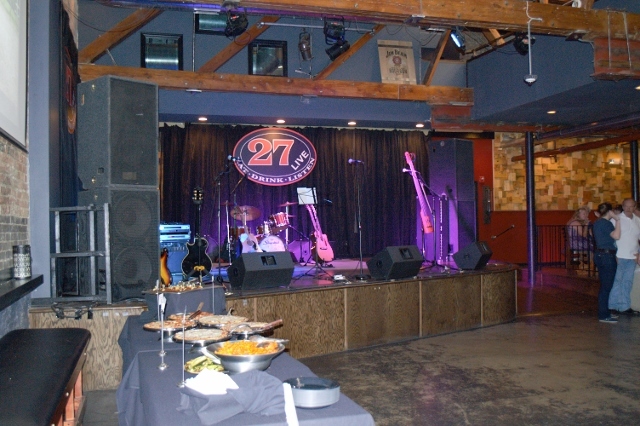 27 Live donated the space and staff, and provided unlimited appetizers for the duration of the event for a reduced per-person fee. This greatly reduced our costs to hold the event. As mentioned above, we also had an online fundraising site established to ensure that individuals who are not able to make it to the event but wished to contribute to the cause had a method to do so. We were able to push the message through social media and our personal and professional contacts as we marketed the main event to reach the largest possible group. We had a live band at our event to provide a pleasant environment where people want to attend, stay, have fun, and potentially donate more through the silent auction. The band was John McHugh & Company. 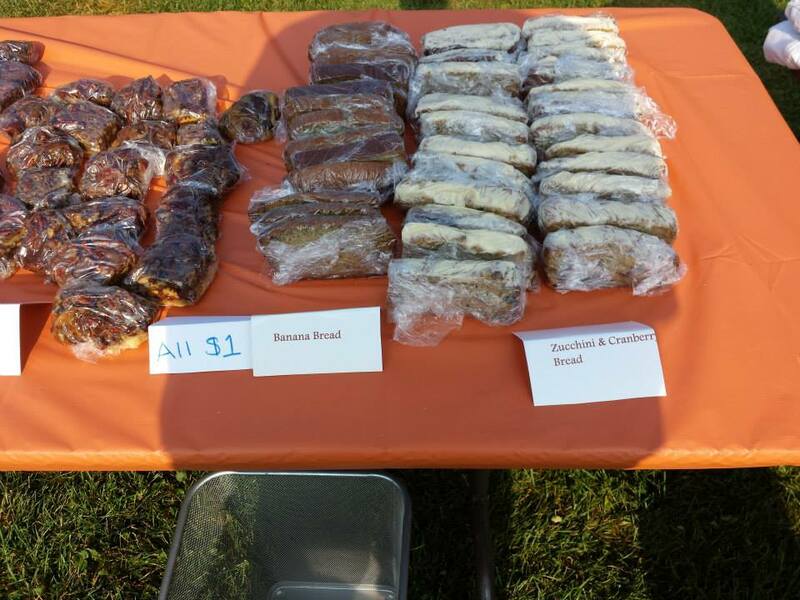 We reached out to local dog-based vendors to have them come out to our event and get visibility with their potential future clients. Most were unwilling to do so, but provided some silent auction items. 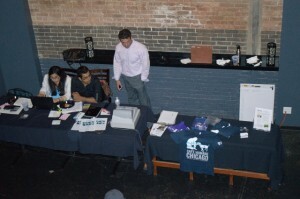 We held a very successful silent auction at the event raising $2000 additional funds for the charity. 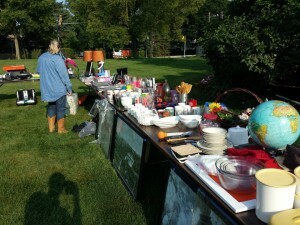 Various vendors, our employers, and family and friends donated items for the silent auction. In addition to the above, we partnered with Safe Humane to volunteer at the Taste of Lincoln Beer Tent. Members of our team volunteered our time at the beer tent to help Safe Humane raise the highest possible funds. 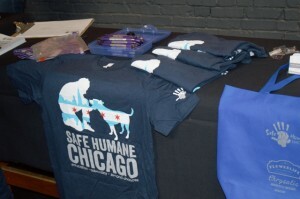 The contributions we raised through tips during this event were accounted in our total proceeds raised for Safe Humane. Overall our team did very well base on the metrics we decided to use at the beginning of the project. We raised a total of 5793 which was at the higher end of what we expected. One of our goals was to keep costs low so we could donate as much of our revenue to the charity that we could. The number of donors we calculated only took into consideration the number of entries on our site. The number is realistically higher but we didn’t take into consideration those who we couldn’t track as well as those who donated multiple time or through multiple avenues. The average gift size of 55.4 was much higher than the cost of an individual ticket for the event which is a reflections on the success we had through the silent auction. On the efficiency front we were able to generate a dollar of profit for every $.30 of expenses. None of the expenses were paid out of pocket. The expenses were the profit sharing we had to give the bar for allowing us to use their facilities. Profitability for this project was excellent with a return on investment of 339%. If a project like this was available for investors, they would gladly jump all over it. As you embark on choosing your own project, there are several things to keep in mind. First, it is important to have one of the team members that is truly passionate about particular charity and have ties to it. One of our team members volunteered for Safe Humane as result has strong ties. 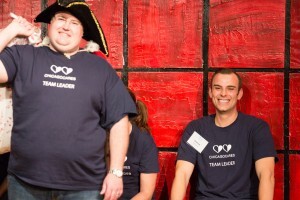 When it came to leverage charity’s network and getting their overall support, we already had that connection and it made things less stressful. Second, it is important to think broad about how you plan to support the charity meaning what type of fundraising activity you would like to do. While it is good to think big, it is also important to be realistic. Since our class had only 10 weeks, it was important to be realistic about the timeframe that you have and what you can accomplish. Some of the fundraising ideas we had included things like special permits, which take long time to obtain. Think big, share ideas with your team and vote on the best option that you can come up with. Third, it is important to have several ways for your network to donate. 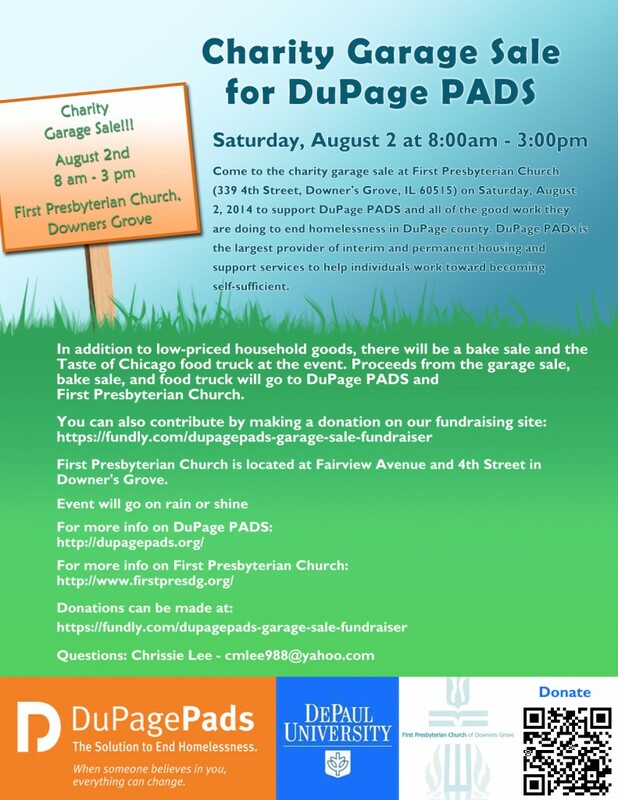 Some people may not be able to attend the event you are hosting, but would love to be able to donate money to your cause. We used online website called eventbrite, which offerred several options including ability to sell tickets to the event as well as collect plain donations. In addition, you are able to easily share your donation website with your network via social network/email, etc which brings up next point. Fourth, social media is critical part of your marketing plan. It is important to leverage it because it is effective and free. 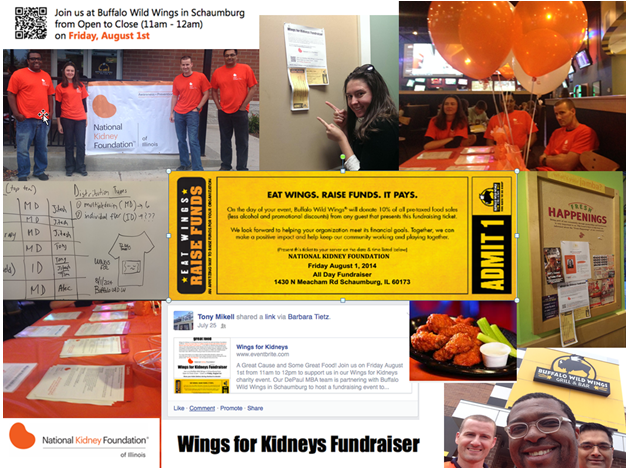 Our charity also had strong following on Facebook and shared our event to help generate excitement and in turn donations. Lastly, it is important to tap into your network and business community for support. 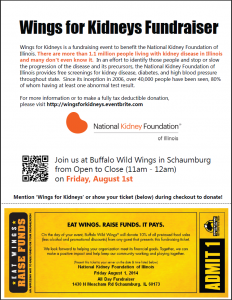 Share your fundraiser info with your family, friends and do it often leading up to the event. People forget to donate, therefore it is important to keep it on the top of their mind. In addition, introduce yourself to your local area businesses. They are looking to promote their lines of business and donating to your fundraiser is a business opportunity. It is important to have good sales pitch, but just plain ask. There are many lessons learned from doing a project such as the one we have done, however there are 2 critical lessons learned that our team walked away with. Importance of Project Management– During the course of project, it became very evident the critical role our project manager played in making sure we have a successful project. During the class, you will learn many skills that are required to become a good project manager. When doing a project in practice like we have, our project manager was very organized, broke down our work structure, created timelines, held weekly calls to ensure timely execution and strong follow thru. In business world, you would hope to have strong project managers to do the same thing on the projects you are working. Risk Management Plan – If you don’t have a risk management plan, you are probably likely going to experience some hard time. When we were compiling risk management plan, we didn’t think that certain things would happen. However, we quickly realized the importance of risk management plan. Expect the unexpected and be prepared to think quickly on your feet. Whenever you start a project, it is important to identify potentially risks and propose how you plan to address those risks. It is critical to identify all risks, ways you would address them and proceed with your plan. 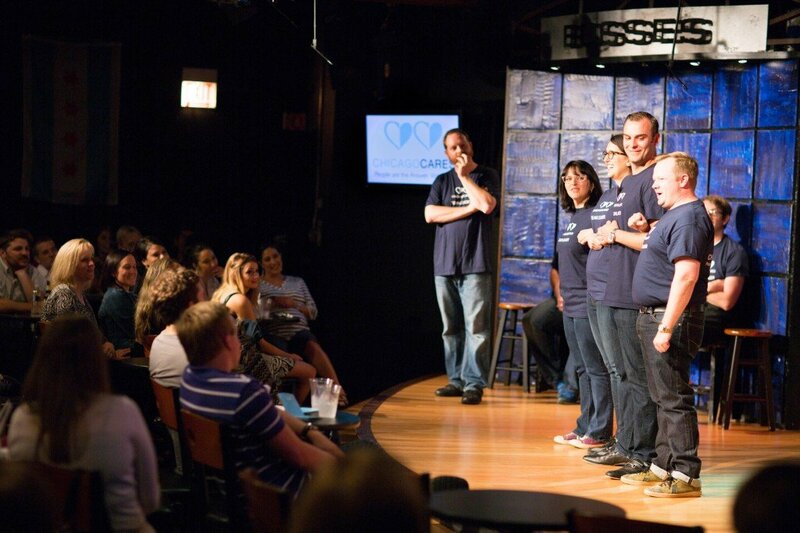 Our team raised funds for Chicago Cares, an organization that builds volunteer experiences to develop and engage the community. 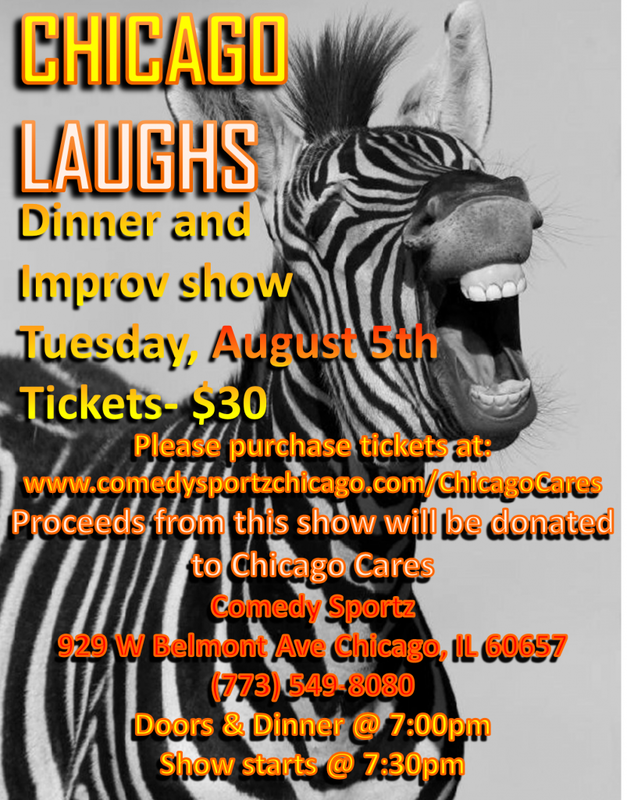 Chicago Laughs was an improv comedy event that was held at Comedy Sportz on August 5th 2014, to raise money for Chicago Cares and create awareness of their cause. 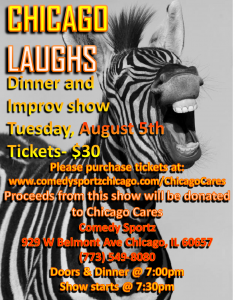 Tickets were available for purchase at www.comedysportzchicago.com/chicagocares. 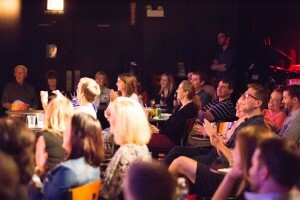 Our main audience was comprised of event volunteers, coworkers, Chicago Cares supporters, family, and friends. Additional money was raised through online donations, corporate donations, and silent auction. The event was fully catered with a steak and chicken taco bar. 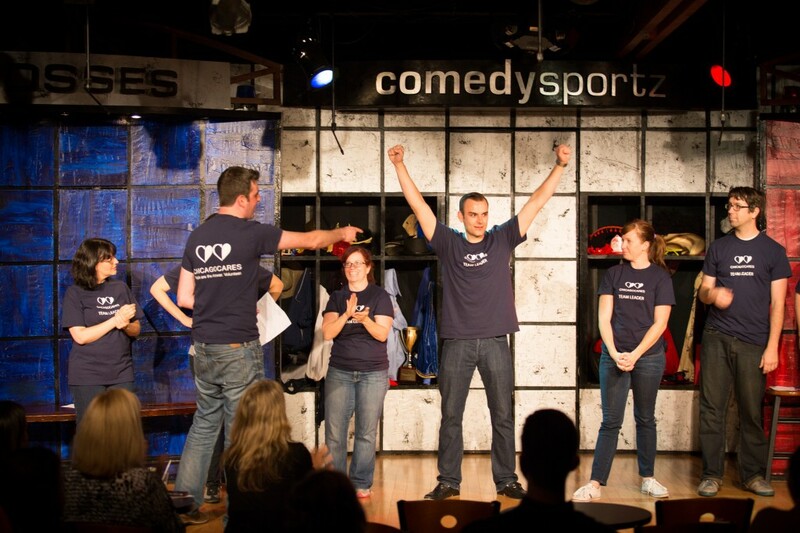 The main entertainment was a two-hour live comedy act presented by experienced improv comedians in addition to two hilarious members of our team. The event was put on with a budget of under $100. The facility, catering, talent, and venue were all donated in support of Chicago Cares. Leave our charity, our volunteers, and our team better off than they were two months ago. 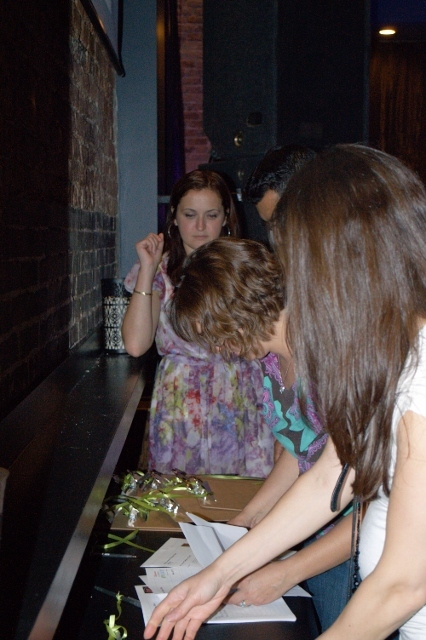 When we were creating our project plan our goals were to raise $7500 and have the event attended by over 100 people. By the time we reached the implementation stage of the project, we had focused in on the results we could realistically reach within the time restraints and available resources. Our methodologies were to focus on one on one contact to encourage ticket sales. We did mass marketing on Facebook, Twitter, and mass email but we found it was more effective to reach out to people individually. To stay organized, we assigned tasks and areas of responsibility to each team member. We had clear set deliverables and had weekly group meetings to make sure milestones were being meet. 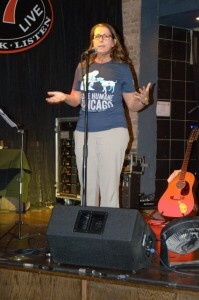 The final amount donated to Chicago Cares was $5530 and with an attendance of 100, including all volunteers. 1) Be sure to make realistic goals, especially with money goals and event attendance expectations. There is nothing worse than having high expectations and not being able to deliver. Create realistic and attainable goals for your team. Make sure the scope and deliverables of the project are well detailed and followed throughout the project. Try to stay on course and don’t get distracted or over burden yourself by trying to do too much. 2) Success begins with planning. A well thought out and detailed project plan will prove to be extremely vital. Be sure to cover all your project management basics. 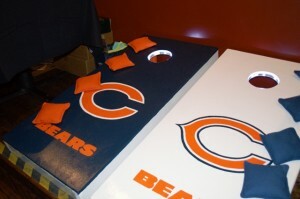 This will create a seamless event that will allow your team to flawlessly execute. 3) Personalized promotion. It was really neat to think about all the tools and technologies at our disposal as far as promotion was concerned. Having the ability to easily use social media like Facebook, LinkedIn, Twitter, etc. seemed like a good prospect. Sending out constant email blasts felt like it would be extremely effective. As it turned out, approaching people individually with a more personalized promotion approach deemed to be much more effective. 4) Remember the cause and enjoy! Don’t get caught up in just trying to raise the most money possible or use the project as a competition. This project is about so much more. Don’t forget to fine tune and practice your newly acquired managerial strategies and skills. Enjoy the fruits of your labor at your event. Sit back and take notice of all awareness, good people, and success that you and your team have brought together. There were many lessons learned during this project as there is with any. Once we finished our event and took a step back, the lessons learned seem to be very clear. Below is a list of some of the major lessons learned throughout our group. It really shows, that if you hire good, trustworthy people, they are going to bring nothing but positives to your event. I believe the case in point was watching the caterer, Tim Dudik, set up the food and seamlessly service close to 100 people without any problems. Another quick and easy lesson learned is to be flexible. Remember to get the job done at any cost and that no job is beneath or above you. Accept and be open to people’s suggestions and be open to creativity. As the event ended for our group it was difficult for team members to think of any issues or problems that occurred. Tom, John and I consistently had surprised looks on our faces throughout the event. Things seemed to be going so well, that it become apparent there was not much else for us to do to help. That I believe is a testament to the vigorous and detailed planning that was performed for the project. With that, having well defined roles and responsibilities was crucial, which really created a well oil machine during the event. 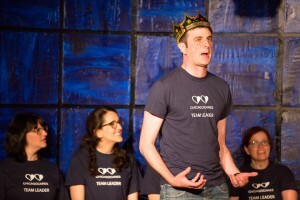 Finally, I believe the group really underestimated one of the biggest advantages that we had, which was a practiced veteran within the improv comedy field. Josh’s expertise, background, and history provided us the blueprint to an extremely successful event. I believe all of these lessons learned really allowed our group to create and execute a terrific event that really went without a hitch. Our team’s goal was to organize a car wash, with the help of some gracious volunteers, in attempt to raise awareness and funds for a Save-A-Pet (SAP) while applying the concepts and principles we learned in our project management class. SAP is a local, nonprofit organization and one of the largest no-kill cat and dog rescues in Lake County that operates a full-time adoption center which provides a safe haven for abused, neglected, injured, and lost animals. Although SAP was unable to host the event on-site, they were able to put us in contact with Culver’s who had partnered with them multiple times before. 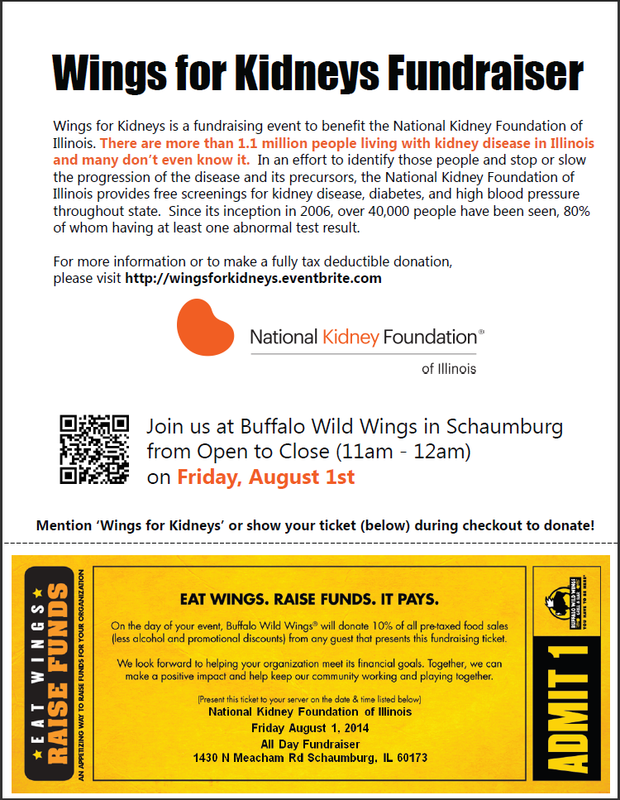 A few email exchanges later, we were able to establish a date, time, and location (July 26th 9AM to 4PM at Culver’s of Grayslake) for our event. The accommodations could not have worked better as Culver’s dedicated a large portion of their sectioned off parking lot for our event and they offered use of their water connection. Fortunately for our team, one of our team members worked for a company that produced almost all the supplies (buckets, sponges, drying rags, and squeegees) we needed for a car wash and agreed to donate all of them for the event. The only supply we needed to obtain was car wash soap which was donated by one of our team members as well. 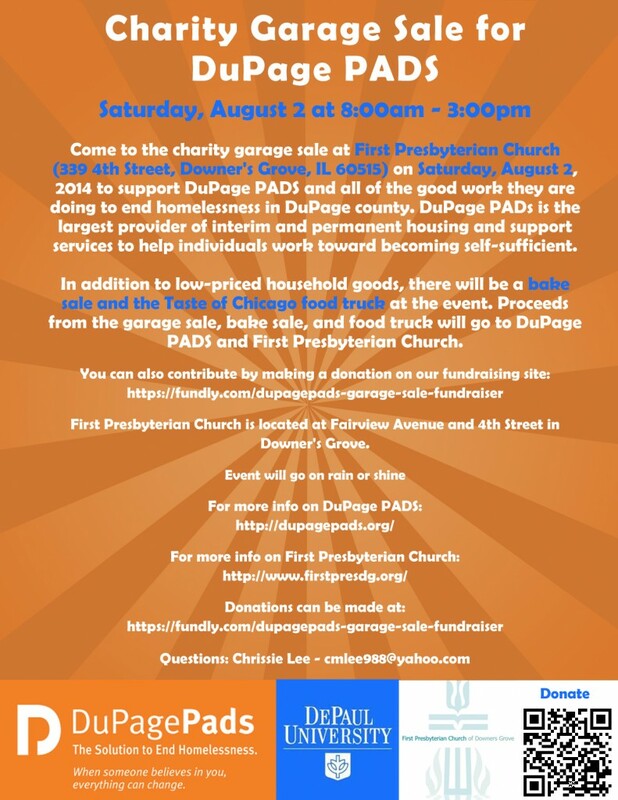 In addition to providing a car wash, we had representatives from SAP on-site with information about their cause as well as pets available for adoption and a shaded area with refreshments for potential donors to sit while they had their car washed. This worked tremendously well as demand fluctuated throughout the day. When demand peaked, the representatives provided a welcome distraction for our donors. Lastly, we had an online fundraiser available for those who wanted to help out SAP but were unable to make it to the actual event. We also had a couple donation jars by the cash registers inside Culvers encouraging people to donate or just give their loose change. Our project progressed from a simple RFP to an execution plan as well as risk management plan. The implementation plan provided an OBS, WBS, and milestone schedule to give us a firm grasp of all the steps, time commitments, and verifications that we needed for our project to be a success. This laid the path for completion, and we just had to execute. Although the execution did not go exactly as planned in terms of personnel due to vacations/ work and family commitments, we all were able to fill throughout the life of the project and pick up where others left off when needed. Luckily, we did not have deviate much from our plan. The most significant deviation was securing a location which took longer than expected. In the meantime, we were able to work on a website and marketing material while the location was being finalized. This allowed us to quickly update for location and distribute once the location was known. The risk management plan was an integral exercise because it made us think about any potential pitfalls that could derail the success of our project. We were again lucky in the sense that we did not have to act on any of our risks. Our project was a success as we generated $970 of donations during the carwash as well as $370 online. 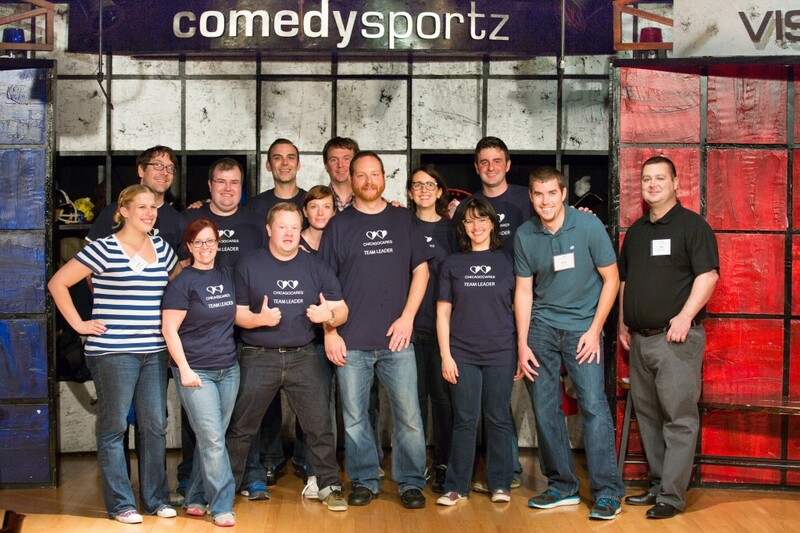 One of our team members was also able to do a company match for $300 giving us a total of $1,640 donated to SAP. Advertise early and often- Even though we thought we had a lot of marketing, we did not seem to get as much reaction from it as we planned. Also, make it personal by sending out emails individually (avoid mass emails) or talking to people directly. Communication is key- Get on the same page with your team members. Know everyone’s availability/unavailability when making decisions and splitting up the work. There is less covering for other people if the work is already divided in a sensible way to begin with. Get to know your charity- ask for their advice since they typically have experience with fundraisers. Also, it is good to use their already established networks. Teamwork- Keep a positive attitude when working with your team. Sometimes you will have to be a team player and be flexible in order to get things done on time or have to compromise since there are many opinions. Have fun!- People are more likely to donate or participate if they see you having fun and doing your best with a project. Enjoy the experience and the fact that you are supporting a good cause, whatever it may be. Listen to ideas- make sure to use small group skills and communicate well with the other team members. Being a good listener is just as important as suggesting ideas. Schedule is crucial- sometimes there is little to no slack so it is important to stick to the scheduled plan. Having a risk plan is just as important to think through the things that could happen. Complete the basics first- as soon as the project starts, do not jump ahead. We all have a tendency to see the potential of how great a project could be, but do not neglect the basic predecessors that need to happen before even getting to that point. We raised funds to support Canine Companions’ Dog Fest Walk n’ Roll, the signature fundraising event for the organization that takes place each year. Canine Companions for Independence (CCI) is a national, non-profit organization that enhances the lives of people with disabilities by providing highly trained assistance dogs and ongoing support to ensure quality partnerships. 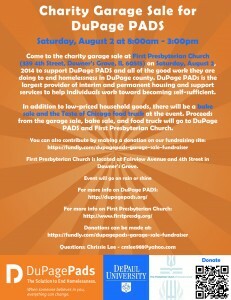 We registered as a team to walk in the event under the team name “Blue Demons”. Following is a link to our team page: http://www.cci.org/faf/search/searchTeamPart.asp?ievent=1100605&lis=1&kntae1100605=D740F008D836481DAA76E914615DBB16&supId=0&team=6008549&cj=Y . In addition to registering for the walk, to raise funds for our team, we hosted a “Rock n’ Roll for the Walk n’ Roll” event on the afternoon of July 27th at Party Animals, a dog-friendly venue in Chicago. At the event, we had a demonstration by CCI graduates, a live band, food, drinks, games, and a silent auction. To further promote CCI, we provided free T-shirts and Frisbees with the Walk’N Roll logo and our website to all attendees. We did not charge an entry fee; instead we focused on encouraging attendees to make donations. We promoted the event through our own social media avenues as well as by leveraging the social media network and website of Party Animals, our event venue, as well as that of CCI to expand our reach. To fund the event, we started a Kickstarter campaign that generated over $2,000 to pay for expenses related to the event. 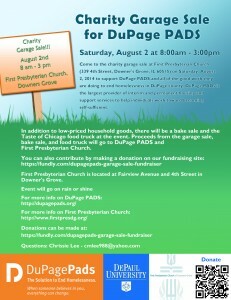 We are also solicited donations from businesses to use as part of a silent auction to be held at the event. 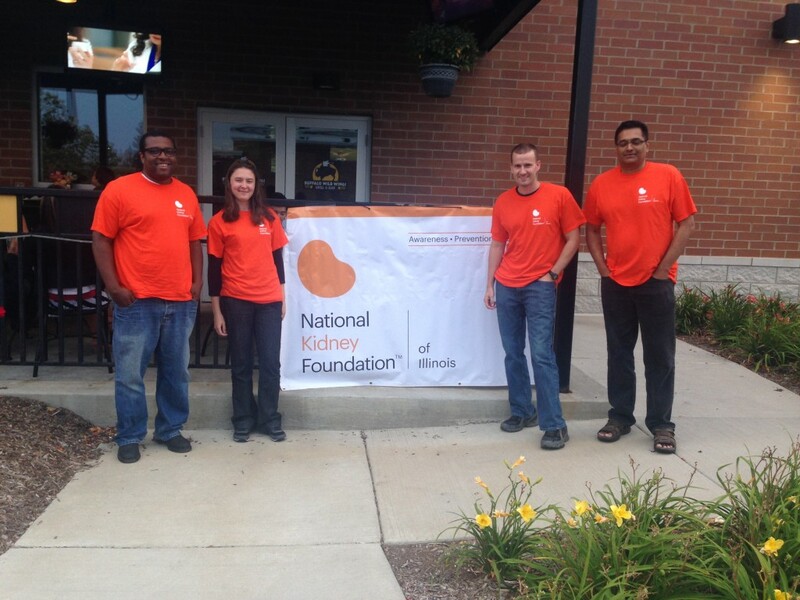 We were successful in raising awareness and funds for CCI, gathering a total of $3,800 in donations, successfully hosting an event attended by over 50 people, and distributing 100 CCI T-shirts and 200 CCI Frisbees. We also reached thousands of people through social media, making them aware of the work done by CCI and the upcoming Walk’N Roll event. We were also successful in applying the principles of project management covered in class. We created a project proposal, a project implementation plan, and project risk management plan. These documents included specific tasks to be completed, timelines, risk analysis and contingencies, and budgets. Planning and putting on the event enabled each team member to apply project management leadership skills, respond to unexpected changes on the day of the event, and work with a diverse team for a common goal. 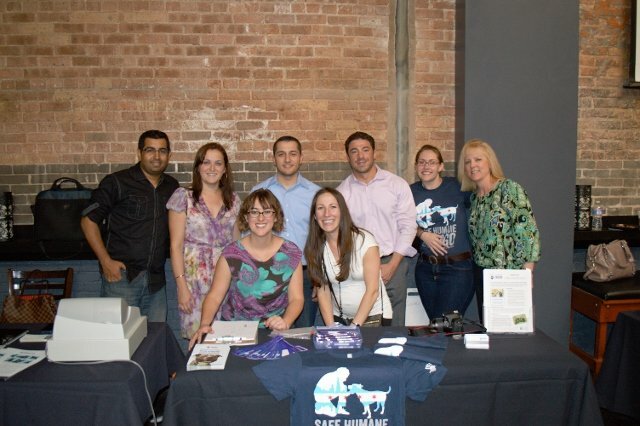 Most of all, we had a great time while supporting a worth-while cause. All of us learned more about the work done by CCI and now have an appreciation for how this organization changes the lives of individuals with disabilities. We worked hard as a team and approached the project seriously, but also took time to laugh and enjoy the experience. 1) Use the project management tools. Projects with multiple work streams and deliverables benefit from the structure provided by project management tools. Taking the time to follow the process and complete each step is an investment in the overall success of your project. Attempts to save time by skipping steps will only result in greater risk to your project. 2) Take advantage of the individual skills of your team members. Our team was comprised of individuals with different skills and abilities. We used this to our advantage by leveraging these differences. The role of the project leader was assigned to someone with project management experience. The financial tracking was done by a team member with an accounting background. A team member with a relationship with CCI was our liaison with the organization. While we all worked on each aspect of the assignment, we benefited by recognizing our differences. 3) Get aligned on a common goal. While each of us made project proposals, once we landed on CCI as our charity and the Rock N’ Roll for the Walk’N Roll as the theme for the event, we moved forward as a unified group. That is not to say we did not have disagreements along the path. However, when issues arose, we were grounded by our focus on the common goal. 4) Do not be afraid to fail. While failure is always a possible outcome, it is not the inevitable outcome. 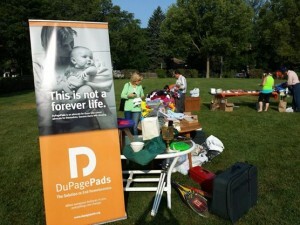 We combined various ides of rising revenue using the traditional donation approach at the event combined with others. We used a silent auction, a photo booth, a game area and various online donation vectors to generate additional donations. There were times when the group did not want to take on the additional risk of having these events as it would take personnel and time to complete the gather of materials for each event. However we stood up to the challenge and combined all these activities to give our guests an entertaining time outside of the free food, free drinks and free rock band. We did not settle for less. We were not afraid to fail. 5) Work as a team, assign one leader and forgive. 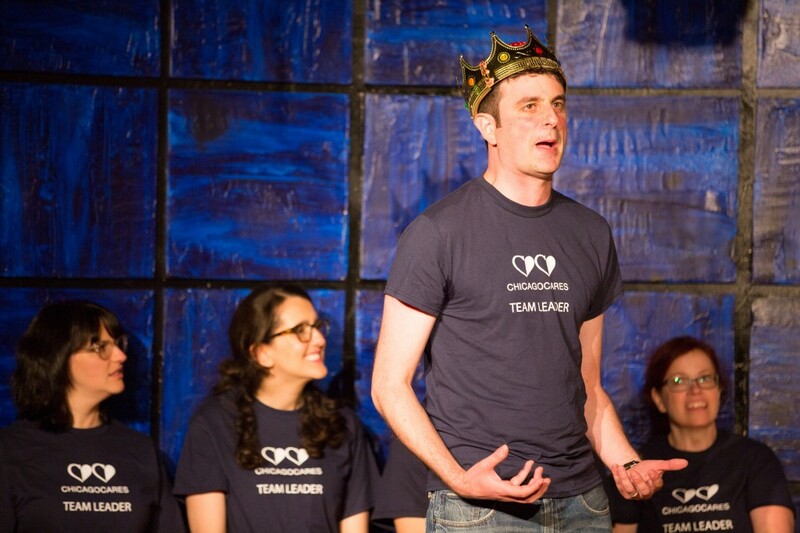 Our team is comprised of all leaders. We each have our own voice and opinion on completing tasks. We listened to each member and worked through the issues that arose by valuing each member in the team for being an equal contributor. Assign a leader to help drive the direction of the team that way it will limit the overall communication issues, by working with one project manager items and work streams organically combine to a successful project. The most important item is to forgive. Forgive yourself and others. When issues arise that prevent others from contributing, call them out on it and ask how the team can help with task or re-assign work. Forgive yourself for not being the leader and dedicating as much time to the project as others. Simply put not everyone has the ability to be an exceptional project manager; focus on the positives you can contribute and forgive your lesser skill set. 1.) Successful project management is a team effort. As mentioned above, each of our team members played a different role and made unique contributions. Our collective thinking and effort made the project more successful than if any individual had undertaken the entire effort. This is true not only from a time and workload perspective, but also from the perspective of the diversity of thought gained by having a number of people contribute. 2.) Risk management is critical. All projects have risk. The more time you spend identifying them in advance and planning contingencies, the greater the likelihood of success. The more complex the project, the more important this becomes. By identifying the risks early on, we were able to be flexible if something did not go as planned. Invariably, something will go wrong with a project of any size and complexity. Planning ahead will enable you to achieve your goal regardless of individual challenges. 3.) Early planning and communication will save time and effort in the long run. There is often a tendency for teams to want to jump into the tasks associated with a project rather than spend time planning. Staying in the planning phase longer than what might feel comfortable will benefit the team and the project in the long run. Early on, some of our team calls seemed to take longer than necessary as we discussed various aspects of the project. Allowing each time member the time to get their questions answered helped ensure we were aligned so we could move forward as one. 4.) Numbers do not mean everything. Metrics are great, but they do not measure the entire impact. 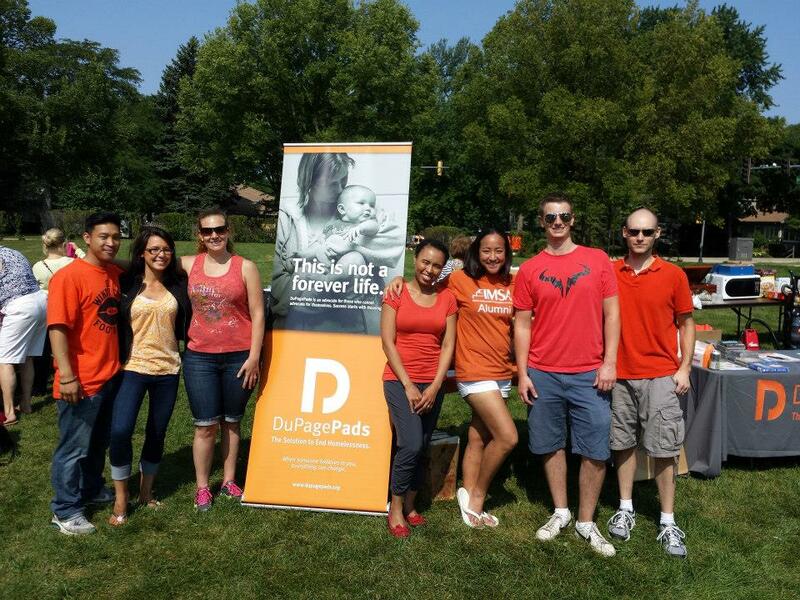 Of course our team reported the donations generated, and the costs associated with the events. But the items that we did not report on truly makes ours project the most successful. 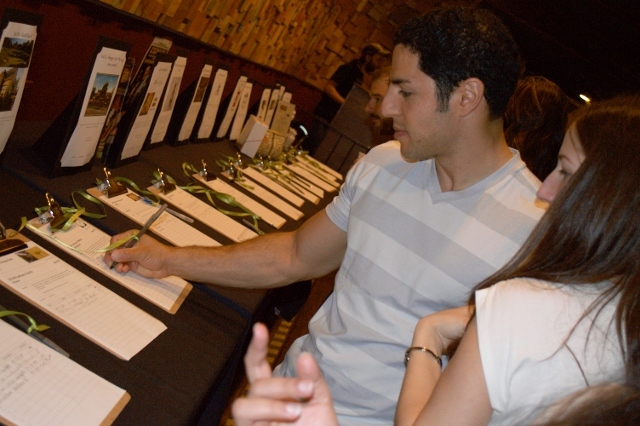 From our event we inspired some of the guests of our event to host a fundraiser for CCI on their own accord. 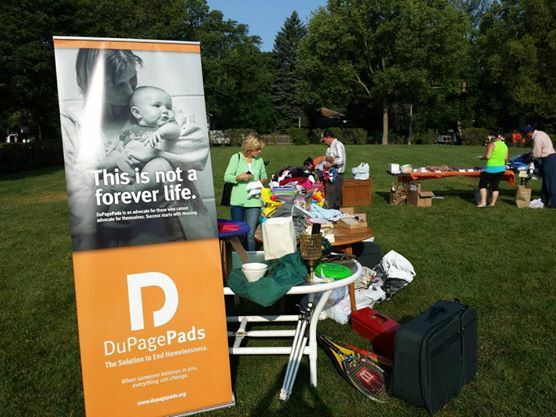 We donated a substantial amount of our t-shirts, Frisbees and other accessories to the group so that they could host another event for the charity. There is no metric for this. The amount of publicity and awareness raised by a single event is hard to calculate and understand the impact from the event, however the ripple effect made from this project will have a much farther reaching effect for the charity and its mission. Therefore while numbers and metrics are important, it is also important to include in the report out the soft topics and items as it will have an impact that may not always be seen in the bottom line.